EurekaLog installer contains precompiled .dcu and .obj files. These files are used when you compile your applications. 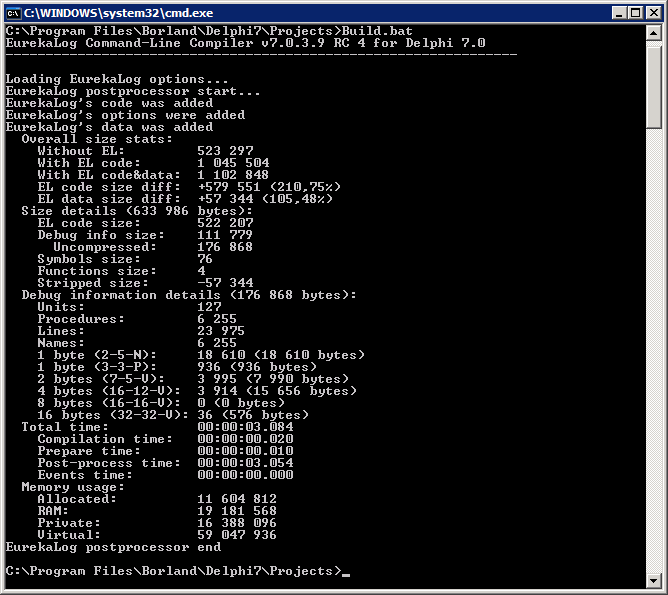 Therefore, there is no requirement to has command-line compiler in IDE. Note: EurekaLog installer also contains .pas files, but they are used only as reference. .pas files are not used for projects compilation by default. Owners of Enterprise (full source-code) edition of EurekaLog can delete .dcu/.obj files and use .pas files instead. Users of Trial and owners of Professional edition are not able to compile .pas files (because they contain only interface sections, but not implementation). EurekaLog is compiled against the latest service/update pack for each IDE, so be sure to install the latest available update for your IDE before installing EurekaLog. You can get the latest update for your IDE from your EDN account under "My registered user downloads" section. 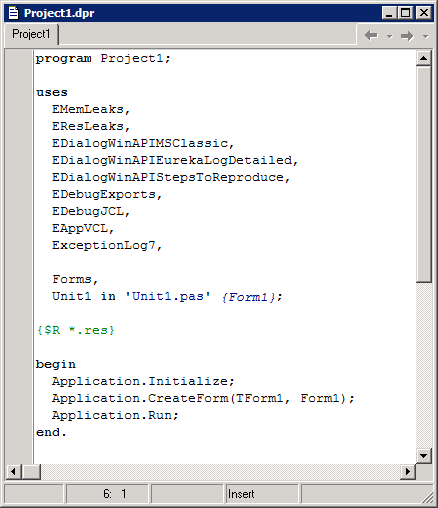 EurekaLog requires processing of compiled executables (post-processing). 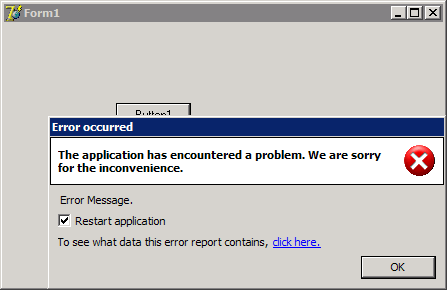 Typically this is done by installing IDE extension to handle this issue automatically. See for more info. Therefore your IDE must have ability to install 3rd party extensions. However, there is a second way to achieve this - by calling EurekaLog command-line tools manually. You don't need to install IDE extensions for this way. More on this below. There are no limitations on number of supported IDEs in EurekaLog, so you can install EurekaLog for, say, Delphi 7 Personal, Turbo Delphi and Delphi XE3 Starter simultaneously. All these files are the same as files for Delphi Professional/Enterprise/Architect/Ultimate. 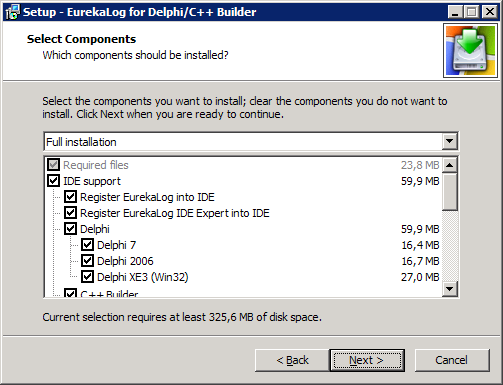 There are no differences in installing EurekaLog for, say, Turbo Delphi and Delphi 2006 Professional. • Personal, Turbo, Starter, and Community IDE's editions can be installed on the single machine. • You can not install two Turbos, two Starters, or two Communities editions on the same machine. So, you can not have Delphi and C++ Builder personalities for the same IDE. 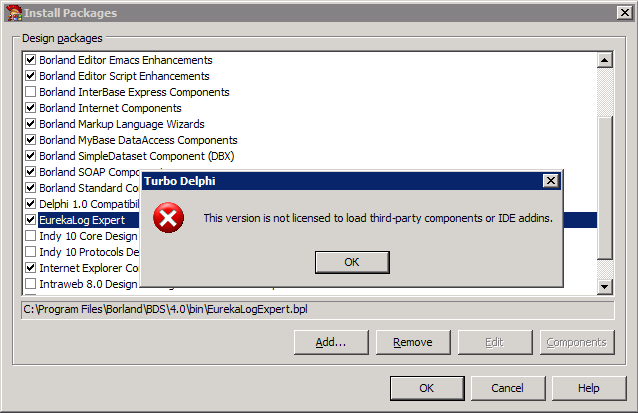 • It's important to not confuse Turbo Explorer and Turbo Professional editions of Delphi and C++ Builder. These IDEs has significantly different limitations for installing EurekaLog. Turbo Professional, Starter, and Community editions of Delphi and C++ Builder allow to install and use 3rd party IDE extensions. Therefore you don't need any special actions to use EurekaLog in these IDEs. Just install EurekaLog as usual. You will see EurekaLog menu items in IDE. All your project will be post-processed automatically. Therefore EurekaLog menu items will be unavailable. Automatic post-processing of your projects (required for EurekaLog to function) will be disabled. Delphi 7 Personal edition allows you to install 3rd party IDE extensions. 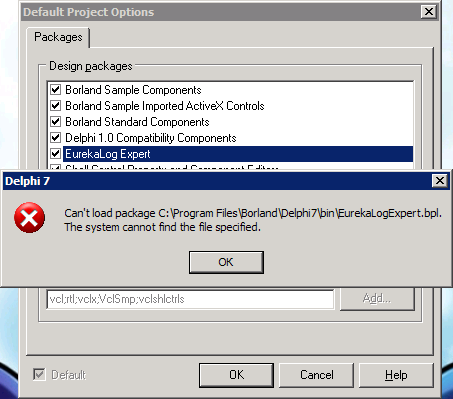 However, it lacks required components (.bpl packages) for EurekaLog IDE Expert. 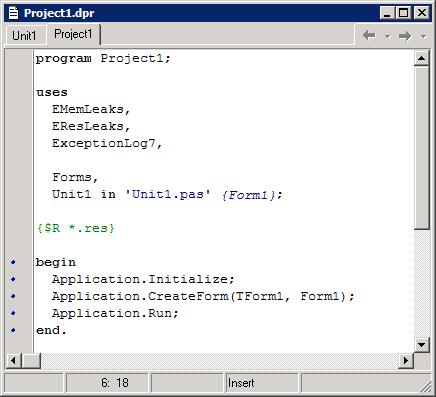 Again, IDE features of EurekaLog will be inaccessible (unless you have missed Delphi 7 .bpl files from somewhere else). Note: You can remove EurekaLog IDE expert by using "Start/Programs/EurekaLog/Manage EurekaLog in IDEs" menu item and clicking on "Install EurekaLog 7 (without IDE expert)" button under your IDE name. The workaround is explained in great details in our help here (specifically, see "Post-processing without (re)compilation" section). Let's do only a quick overview in this article and provide a practical example. The example will use Delphi 7 Personal, but the same things should be applicable to other IDEs. Important note: order of units is important. These units must be listed first - as shown above. These are the minimum units for EurekaLog to work correctly. However, you may want to add more units - such as EDialogWinAPIMSClassic for error dialog in MS Classic style, EAppVCL for hooks on Forms unit, EDebugExports to show functions from DLLs in call stacks, ESendAPIMantis to submit bug reports to Mantis bug tracker, etc. 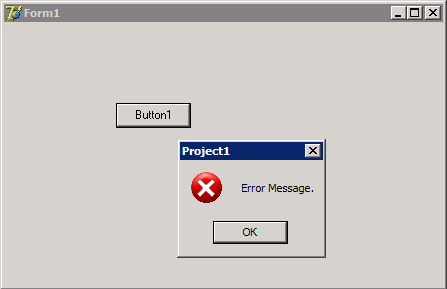 Second, you need to setup project options for debugging. Please see "Configuring project" article. That article will explain what options are required - you should enable them for your project. Third, you need to create configuration for EurekaLog. Use "Start / Programs / EurekaLog 7 / Tools / Settings Editor" menu item to launch standalone editor for EurekaLog settings. Setup EurekaLog options as you desire and click on "Save" button to save all options to .eof file. Now you can place a button in your application to raise exception (to test EurekaLog) and compile your application. It's better to make a "build" for first time, not just "compile". Your project will be compiled with EurekaLog and debugging options, but EurekaLog will be in disabled state. You can run your application, it will be fully functional, but exceptions will be handled by RTL/VCL, not by EurekaLog. "C:\Program Files\Borland\Delphi7\Bin\ecc32.exe" "--el_alter_exe=C:\Program Files\Borland\Delphi7\Projects\Project1.dpr;C:\Program Files\Borland\Delphi7\Projects\Project1.exe" "--el_config=C:\Program Files\Borland\Delphi7\Projects\Project1.eof"
• Last command (pause) is optional. Now you have to run this .bat file each time after compiling your project. Run your application now. If you do everything correctly - EurekaLog will be active, and exceptions will be handled by EurekaLog. Some auxiliary EurekaLog functions may be inaccessible due to missing units from Personal/Turbo/Starter edition. • (For both) Compile -> post-process -> run from IDE. This should work, as long as file's date/time is untouched. IDE will think that file was not modified, thus it will not recompile it (erasing EurekaLog). Make sure your anti-virus do not alter date/time during EurekaLog's post-processing. Note: this limitation is true only for older IDEs. Newer IDEs has build events for project, so you may call ecc32/emake from these build events.